When the copper contained in the glaze meets an intense reducing flame in the kiln, a red colour emerges: the colour is called “cinnabar” for its likeness to the colour of a natural mineral, cinnabar, also known as mercury sulphide. In the Ming China (in the 14th to 17th centuries), cinnabar ware was appreciated for its jewel-like beauty. 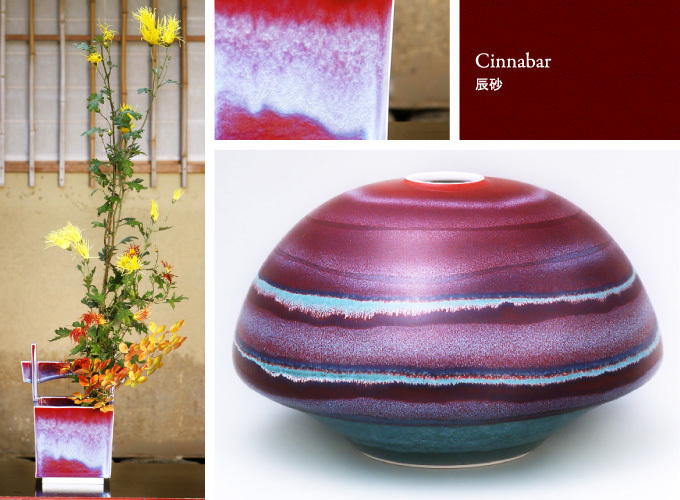 The colour of cinnabar varies from pale red to dark red; at the Shinemon Kiln we strive to create the deep red of ruby, a mysterious red that could only be realized by using carefully selected ceramic materials and firing them for long hours in 1300 degrees centigrade .